Over the last couple of years SEO has changed drastically with Google waging war on the black-hats and spammers with the panda and penguin algorithm updates. In the midst of all the animal fuelled chaos social media has continued to rise to prominence as not only a way to connect with friends and family but also as a means of doing business on the web. We all know the value of social media for engaging customers and increasing brand awareness but the direct effects of social on traditional search marketing are still in their infancy. Google looks set to push the importance of “people” on the web; continuing to encourage the use of Google+ for content authorship, encouraging the use of real names on the web and with the recent introduction of Google+ sign-in. At the rate SEO has changed over the past few years it would be no surprise to see social media becoming a significantly more important ranking factor over the next 12 months. 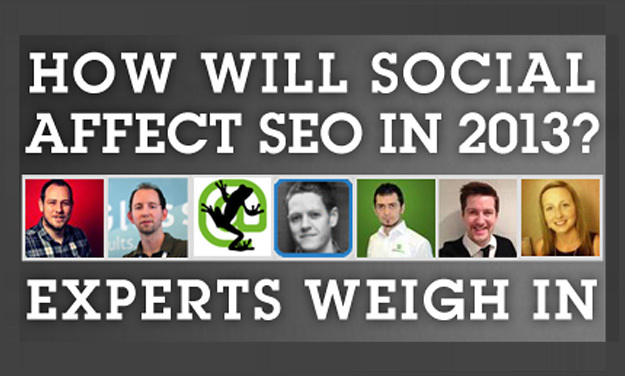 I think social will affect SEO in a few, small ways in 2013. I can’t see it drastically changing things from where they are right now, but I think that Google will take a few more steps towards understanding “people” online. This means that they can do a better job of interpreting social interactions between people which can allow them to give more / less weight to them. For example, Google may be able to understand that a link from a blog post written by Richard Branson is worth more than a link from a blog post written by Paddy Moogan. Bill Slawski wrote about this in 2011 and I can see Google making small steps toward this, it is clear they are already trying their best to get more semantic relevance from the data they have. They will be able to add a new layer of data on top of PageRank / Trust Rank which, for SEOs, will change the amount of link equity those links pass. So SEO companies will (rightly) have to start thinking about engaging with real, influential authors online because not only will they help you reach a wider audience, I feel the links themselves could be worth more too. I’m not sure even the search engines know the answer to that. We have to be careful looking for the Holy Grail of rankings factors. When Google introduced PageRank, the needle moved from on-page to links, but eventually they realized that links could be spammed and on-page still mattered. Social, user signals, AuthorRank, etc. are additional layers to a complex problem – they won’t replace what came before them, and how useful they are really depends on how they evolve. Obviously, Google has bet a lot on Google+, for reasons that go way beyond social, so they’re biased in some ways. Facebook’s push toward search could also change the game. Overall, though, I expect the impact of social on SEO to be gradual, at least in the short-term. Of course, there are plenty of reasons to take social seriously that have nothing to do with SEO. I’d just be wary of chasing social ranking factors at the expense of link-building, content marketing, and other tactics that have long-term value. Currently the search engines are still trying to understand social signals, their relevance and how they can be integrated more into their search algorithms. The web has obviously become fragmented and communication has evolved with ‘social media’, so the search engines are desperately trying to do the same. The difficulty is social signals are muddy, they don’t always prove relevance and are still easily manipulated. Hence, at the moment, purely as a ranking factor, the weight of social signals in search engine scoring is obviously much lower than links, but they still do play a role, particularly in QDF. 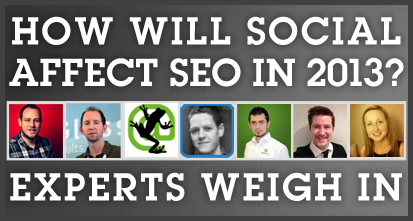 I believe this weight will start to increase, as the search engines work out how best to use them. Social as part of SEO offsite strategy will be even more essential in 2013 though. It’s already vital in communicating your message and content and reaching your target audience; which all help to attract links, raise awareness of the brand, drive visits/conversions etc. Not all verticals lend themselves particularly well to social, but we are seeing more businesses trying their hand even when it doesn’t come naturally. Finally, the newly released Facebook graph search will be of interest to SEOs now, but I don’t see it killing Google in 2013 somehow! Facebook and Twitter will continue as the two major platforms while Google continue to push Google+, even though lots of people in the real world don’t use it, including their own employees. 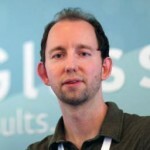 Google Authorship will become increasingly important though! 2013 will see the continued blurring of the lines between what is considered ‘traditional SEO and linkbuilding’ and PR outreach, and an SEO’s role will continue to radically alter to adapt to those changes. Good SEOs are often skilled at digging down into the real numbers of an online marketing campaign, and social media is an area that would potentially really benefit from a bit of demystification. There are still too many ‘social media gurus’ who are all talk, and it will be nice to see more SEOs getting more analytical with social media and delving into the real benefits and results for clients. We’re already getting there with more statistical and analytical approaches to social media connections – audience targeting involves identifying influencers, connections and content shared to discover the best types of content and people to target in outreach – and there’s more to come. With the changes to the Google algorithm over the last year SEOs have to measure correlation between our work and the results slightly differently: links generated > traffic/sales increases will no longer suffice and we’ve moved to content produced > people influenced > positive link/social signals > traffic/sales increases. And if you haven’t already guessed, social media can be fairly important in at least a couple of those. When Google and Bing confirmed they’re using social signals as part of their ranking algorithm many webmasters imagined a complex and sophisticated algorithm. In fact from numerous evidence available out there (including direct conversations with members of Google’s and Bing’s teams) we can conclude that social signals in the past few years have been heavily link-based. Finer details signals such as number of followers, lists, likes remain elusive in terms of their effectiveness. A handful of rather serious studies were performed by different SEO professionals in this field, but nobody offered a high confidence answer so far. That said both leading search engines are serious about their social signals. Bing is dabbling, lost in its temporary alliances and social direction while Google charges ahead at supersonic speeds and high level precision – Google+. I already wrote about why Google went social and described the logic behind their social network so I won’t go into that too much, but once thing is for sure – they’re serious about social signals and are continuously findings ways to use all that data to give their users better results. Make no mistake, Google+ is their #1 priority and every other social signals will fall as a second priority to that. At best they may learn things from running their own network and apply the algorithmic treatment to equivalent signals on other networks (e.g. plus & like). At this point in time, we’re looking at relatively ‘dumb’ social media algorithms but research and testing on Google’s end show promising features. Will we see some of those in 2013? Yes, but as usual the impact will be gradual. Social media and SEO sit side by side and I can only see that relationship strengthening in 2013. Social signals already have the power to massively increase the prominence of a piece of web content and anybody who’s involved in content creation has to bear that in mind at all times. While many say ‘traditional’ SEO is dead, there is still a need for strong structure within websites, blogs etc, as without the relevant meta data, the search engines can struggle to index without them, however it is quality content and its spread via social media that will really separate the wheat from the chaff. Google Plus is the one to watch from a social network point of view, making sure your content is part of the wider Google infrastructure is now key, as is ensuring your content is organised with ‘author rank’ in mind. We all know that social media is becoming increasingly important in SEO and we can see that the major search engines want to incorporate social into their algorithms so that search results return more personal recommendations. Things do seem to be developing but I think Google are further off this ideal algorithm than they’d like it to be, simply because not everyone is using social in the way that Google wants us to yet. However this doesn’t mean that as SEO’s we shouldn’t be taking social seriously in 2013. I think the earlier we integrate social into SEO strategies, the better, as it will take time to build up a quality following of brand ambassadors in the same way that it takes time to build a quality backlink profile. I imagine that when social has more of a visible impact on keyword rankings, the grey/black hat SEO types, or those who are late in adopting social, will think they can manipulate social and essentially find a way to gain thousands of followers quickly (well this is obviously already happening). By the time Google gets it right (if they ever do get it right), this kind of technique won’t have much impact on the rankings, but instead the businesses that have been established on popular networks such as Facebook, Twitter and Google Plus for a longer time, who have kept it reasonably active and have a natural looking ‘follower profile’ will benefit the most. Obviously there will be a lot of other social factors on rankings and they will be designed to be more personalised but for the purpose of this question I’m focusing on social account age simply because it doesn’t seem to have been discussed much. My guess is that the age of a social profile will be taken into account in a similar fashion to domain age and history being a key ranking factor. Hence why I suggest that for anyone who hasn’t integrated social into their SEO or online marketing strategy yet, 2013 is the year to do so, or you’ll risk falling behind in the future. So that’s what some of the big players in the industry think; but what do you think? Please leave us a comment or get in touch with us on Twitter, Facebook or Google+.